Synopsis: After escaping an attack by what he claims was a 70-foot shark, Jonas Taylor must confront his fears to save those trapped in a sunken submersible. Review: I like sharks. I like movies. I like shark movies. From Jaws to The Shallows to 47 Meters Down, I’m a fan of anything featuring an underwater predator snacking on unsuspecting prey. Even in lesser known entires like Bait or Shark Night 3D, there’s a certain amount of satisfied fun that comes with these creature features. Of course, it helps I’m writing this review from the landlocked safety of Minnesota (aka Land of 10,000 Lakes) so these ocean tales of killer sharks don’t dredge up the same fear in me that might plague someone living near the open water. Steve Alten’s 1997 “Meg: A Novel of Deep Terror” was tailor made for a screen adaptation. 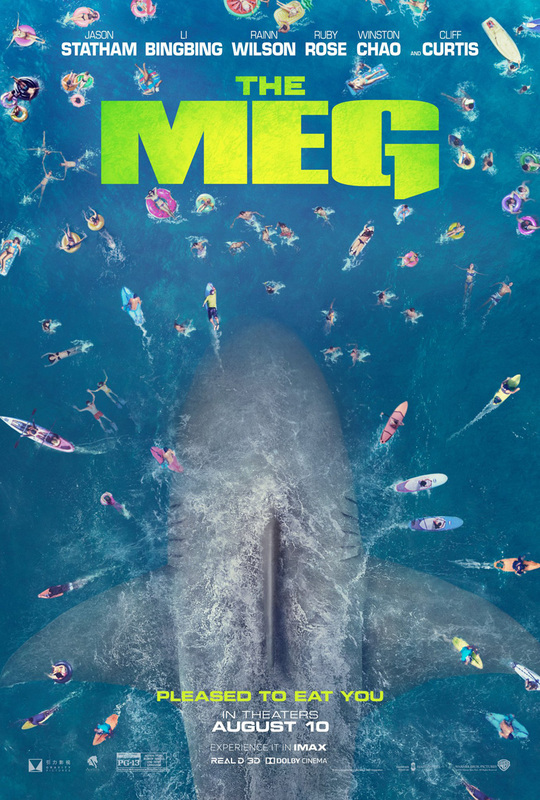 After spending a solid 20 years in development hell and tossed around by several studios, directors, and stars, The Meg has finally surfaced. Was it worth the wait? Did director Jon Turtletaub (While You Were Sleeping) and star Jason Statham (Spy) strike the right balance of fun and fear that made Alten’s original novel (and multiple follow-ups) such a blast? I can’t say for sure whether or not you’ll go for this sometimes scary, sometimes silly late summer adventure but for someone like me who has waited so long for this sizable shark soup it satisfies a hunger two decades in the making. Not having read the book in a good decade, I picked up my tattered copy and skimmed the pages before heading out to the screening. Alten’s no Hemmingway but he manages to take the reader along for a plausible (for 1997) ride to the depths of the ocean where a fish long thought extinct has been living undisturbed for thousands of years. The screenplay from Dean Georgaris, Jon Hoeber (Battleship), Erich Hoeber (Red 2) retains elements and a few characters from the novel but alters the action for its star and international supporting cast. At an underwater research facility in the South China Sea, scientists are using sophisticated underwater submersibles to dive deeper than any human has before. They hope to prove the existence of another underwater ecosystem thousands of feet below sea level. Their attempts at a scientific breakthrough instead release a gigantic Megaladon, a shark long since though extinct. With little time to warn neighboring countries, the crew must track down the deadly shark before she gobbles up throngs of swimmers along the coast. Reframing Statham’s character Jonas Taylor from a marine biologist to a grizzled deep sea rescue diver allows Statham to do away with the formality of a pretending he’s had a scientific education and clears the way to draw on his brawn to save the day. Whereas the novel’s Jonas eventually comes into his own set of brass balls, Statham presents as a no-nonsense Hercules from the word go. He’s nicely matched by Li Bingbing (Transformers: Age of Extinction) as Suyin, the plucky daughter of the head of research (Winston Chao, The Wedding Banquet) at the scientific laboratory involved with the discovery of the massive shark. Suyin and Jonas parlay their growing (and nicely unforced) chemistry into believable teamwork as they work together to use their collective bravura to save the day. While Statham and Bingbing are pleasing leads, Turtletaub has a bit of a mixed bag in the supporting characters. There’s a whole lot of people popping up and sadly not all of them serve their purpose by becoming fish food by the time the credits roll. Ruby Rose as a tough scientist and Sophia Shuya Cai as Suyin’s playful daughter fare best while Cliff Cutis (Whale Rider), Ólafur Darri Ólafsson (The Secret Life of Walter Mitty), and Page Kennedy do what they can with their stock character roles. The biggest head-scratcher is Rainn Wilson (Cooties) as the egocentric money man behind the entire operation. Wilson, best known for his brilliant work on The Office is truly miscast here, never funny enough to be comic relief or villainous enough to earn our bloodlust in rooting for him to get tenderized by the shark. Ah…the shark. You want to know about the shark, right? It’s well documented that during the production of Jaws the mechanical shark was prone to breaking down, which gave director Steven Spielberg the challenge of showing less and implying more. This lead to that movie becoming a classic but also meant for future genre movies using a practical creation was far more difficult than creating a sizable beast using special effects. I’m fairly sure our titular monster is all CGI and aside from a few sketchy renderings it’s mostly a handsome bit of movie magic that blends seamlessly with the live action. This leads to some ample scares (jolts more like it) and sustained bits of action, especially in the jam-packed final third of the film. Where I found the film to be lacking were the moments when the shark wasn’t on screen. That’s where the screenplay shows it’s flimsiness and resorts to some eye rolling dialogue clearly meant to be judicious exposition. This being a film largely financed by international producers , there are specific moments that feel like cultural insertions (father-daughter bonds, noble deaths, etc) rather than plot points. Still, even the dumbest sounding dialogue is delivered with a harmless earnestness that’s easy to forgive. A pure popcorn extravaganza, The Meg swims ashore this August to take a bite out of the late summer box office and stands a good chance at doing well in the U.S. but even better in foreign markets. Expect the movie to open big in Asia and take in enough money to generate a sequel – and if it’s handled with the same balance of camp and thrill, I’ll be first in line to see it. Synopsis: When a submersible lies disabled at the bottom of the Mariana Trench, an expert deep sea diver is forced to confront his fears and risk everything on a single question: Could the Carcharadon Megalodon – the largest marine predator that ever existed – still be alive and on the hunt? 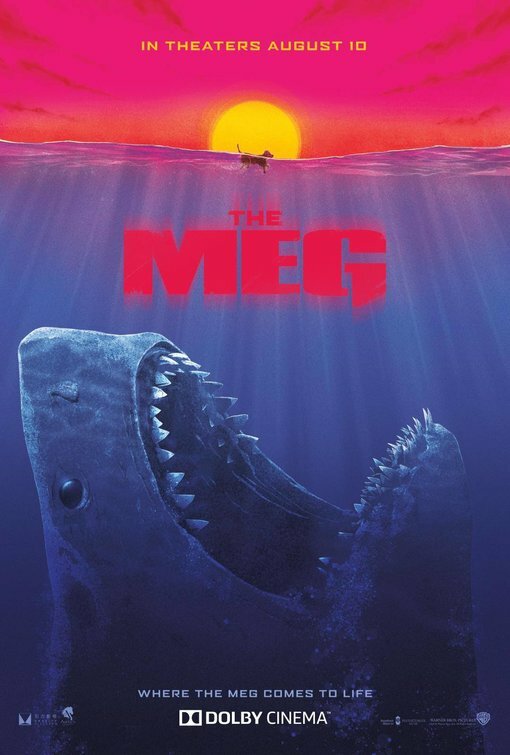 Thoughts: This lover of all things (and movies) related to sharks has been waiting for The Meg for almost twenty years. Based on Steve Alten’s silly but entertaining beach read MEG, the film rights were snapped up right away but the movie took forever to get off the ground due to its sizable budget. Warner Brothers (the studio behind Deep Blue Sea, the last decent shark flick released theatrically) finally took the plunge, added a “The” to the title, reworked the plot, wisely partnered with an Asian studio to maximize international box office revenue, and in August we’ll see just how well it all paid off. This first look at The Meg has plenty of exciting images but also an unexpectedly comedic slant that I’m not quite sure about. Based on the tongue-in-cheek feel, Jason Statham (Spy) could be a good fit for the leading man but it’s clear that while this one has Jaws in its veins its not angling to take itself too seriously. Synopsis: A day-dreamer escapes his anonymous life by disappearing into a world of fantasies filled with heroism, romance and action. When his job along with that of his co-worker are threatened, he takes action in the real world embarking on a global journey that turns into an adventure more extraordinary than anything he could have ever imagined. 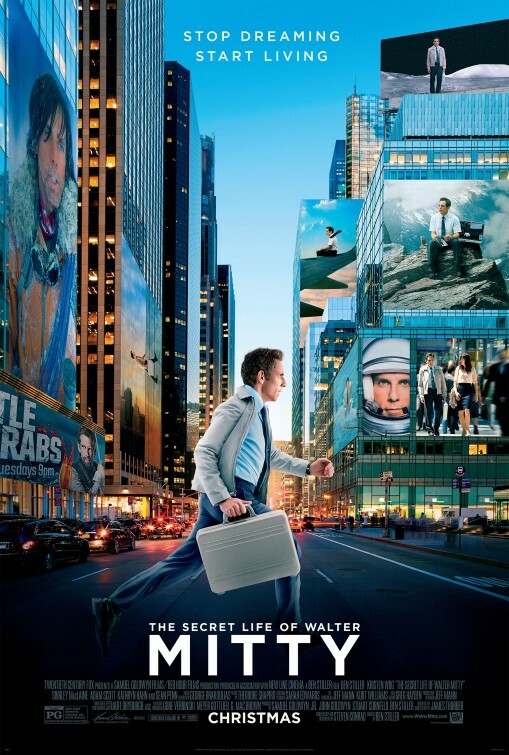 Review: The Secret Life of Walter Mitty is a movie you should see in the theaters on the biggest screen possible. There…I wanted to get that out of the way first and foremost because I know there are some people that want to know if a movie is something they should make the effort to see in theaters or if it’s one they should wait on until it’s available for home consumption. And The Secret Life of Walter Mitty is surely one that will be enjoyed in a movie theater where the picture is clear and the sound is booming. That’s because director Ben Stiller, cinematographer Stuart Dryburgh (I Don’t Know How She Does It), and composer Theodore Shapiro (Hope Springs) have collaborated well to deliver a movie that looks, sounds, and more importantly FEELS good…and one that some posited would never be made. Loosely adapted by Steve Conrad from the short story by James Thurber, The Secret Life of Walter Mitty doesn’t align much with the 1947 Danny Kaye film of the same name, jettisoning the earlier films central plot and replacing it with Stiller’s nebbish take on Mitty as a Life magazine photo editor journeying all over the world to track down a single frame of film that is to be used on the cover of the last edition of Life magazine. Adding some wrinkles to this journey is Walter’s tendency to have grand flights of fancy where he says the right thing, wins the girl (Kristen Wiig, Girl Most Likely), and battles back the juvenile antics of his haranguing boss (Adam Scott, Friends with Kids). These daydream-y moments pepper the first half of the film but gradually begin to be supplanted by Walter’s real life adventures, which far surpass anything he could have imagined – giving the whole film a dream-like element that had me wondering more than once if it was all happening in his mind (I won’t give you an answer to that question…you’ll have to decide for yourself). The film has been pretty unfairly criticized for looking TOO good, more like a well produced Super Bowl commercial than an actual film and I can’t say I agree with that at all. Yes, the cinematography is brilliantly uncluttered, deftly showcasing some beautiful foreign vistas in Greenland/Iceland and various mountain ranges but I believe Stiller and Dryburgh made it that way because we’re seeing the film through the eyes of a man who could never have imagined the sights he’s seeing. Despite some egregious (even for a Hollywood studio standard) product placement, the film is a delight visually. There’s also some poignant moments in Conrad’s script, whether it be Walter’s interaction with his matter of fact mother (a sweetly salty Shirley MacLaine) and Peter Pan-y sister (Kathryn Hahn, We’re The Millers) or his conversations with a rugged adventure photographer (Sean Penn) that may hold the key to his journey of discovery. Wiig and Stiller’s romance is ever so slightly treacley (of course she’s a divorced single mom and of course there’s a scene where Stiller thinks she’s getting back together with her husband) but Wiig and Stiller are gifted enough to inject these moments with the right kind of gravitas that supersede any failings the script has to offer. The movie is also genuinely funny, with Stiller’s interaction with a drunk helicopter pilot (Ólafur Darri Ólafsson) being the only moment I laughed until I cried in recent memory. The PG rated film is absolutely family friendly but I’d encourage parents to not be deceived that very small children will like this as much as, say, a 10 year old would. This is not a Night at the Museum style of family film…but one that parents can take kids to and have a nice discussion about family and future. Like The Way Way Back, The Secret Life of Walter Mitty has a warm empathy emanating from its core that makes it a very worthy choice for the holiday season. The film stopped and started for years while the right director and star were located and it’s nice to see that Stiller fit the bill for both roles. There’s a lot of solid work on display here and I found Walter Mitty’s adventures to be right on par and possessing more meaning than anything that Iron Man could muster up.